AzBaja.com, Home of the VW Baja Bug -:- Baja Forums -:- AzBaja.com Members -:- Projects and Builds -:- MeanGreen's Baja Build. Baja Forums -:- AzBaja.com Members -:- Projects and Builds -:- MeanGreen's Baja Build. Post subject: Re: MeanGreen's Baja Build. yea,it turns the rite way,and yes i have found an adapter for it at kennedy,it says it for a 2.5 jeep,but they are the same engine....and they offer a 60 degree chevy v-6 adapter which will bolt rite in,i know becuz 1 of my s10 had a blown 2.5 in it so i put in a v-6 2.8 into it no probs.so eather one would work perfect. All engines turn the same way...with a note: Corvair and some hondas turn the wrong way. But corvairs turn the same way as all chevy engines it's just you mount to the trany from the nose and not the tail of the engine. my thoughts x-actly az....i just didn wanna run my mouth bout sum'n i was not perfectly sure of. so,i was just gunna throw on a new head gasket/intake/exuast gasket and run it,but i was looking on the net last night and found out that there is certain hond rods u can install in this engine,and have your crank offset ground that will make it rev really quik so i think i am gunna look into that along with getn the puter programmed and a header/cam upgrade...should put me at about 140-150 hp fer WAY less than a vw engine would cost to get that much power..any thoughts ? 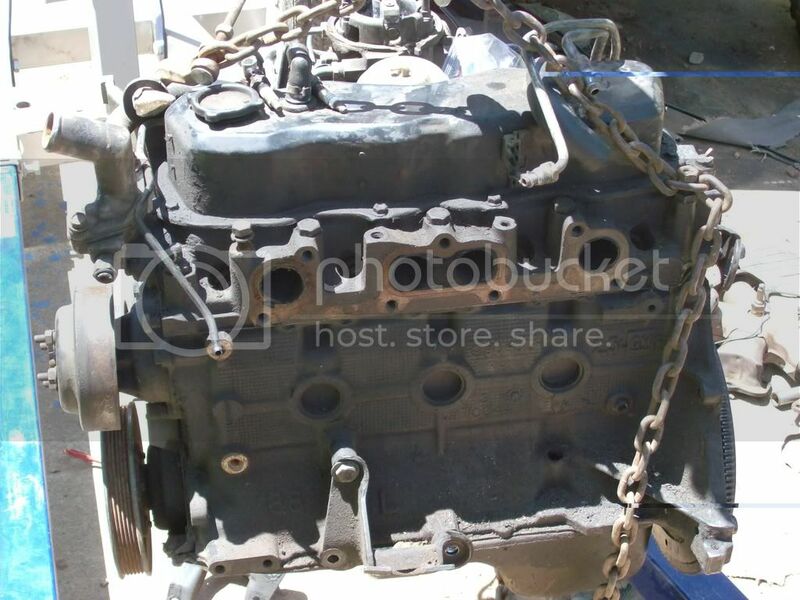 i really like this engine becuz,it will fit in the bug and i wont have to clearance the fire wall for the dizzy like on most water-pumper installs,and its narrower than a v-dub oviusly,its gunna sit about 4 inches bellow the bottem of the luverz,duzn hang as low as a v-dub and its only gunna be about 4 or 5 inched longer installed than a vw with a trimill. 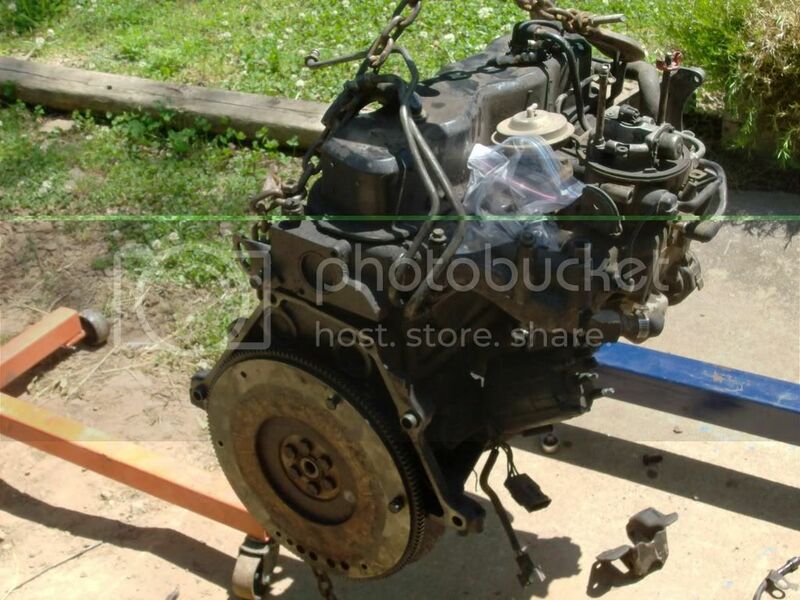 ...should put me at about 140-150 hp fer WAY less than a vw engine would cost to get that much power..any thoughts ? Yeah. Are you prepared to face the wrath of your aircooled bretheren? Kidding! How much is the weight difference tween this and a VW? Where are you planning on mounting the radiator? Except fot the bumpers, paintjob, interior, dash, uhm , lots more. 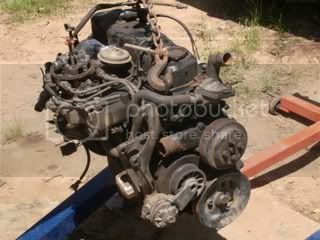 well as far as weight diff goes....i can pic eather the bug or the s-10 engine up and to me it feels like around 100 pounds diff but i dont know fer sure....and the a/c is the rought i'm headed as well....and i plan on mounting the radiator/condencer beside the engine like az has his with dual electric fans and a scoop that covers to all to protect an hopefully help direct the air to the radiator....but if i donjt like the wya that all looks i mite do some sort of spoiler or sumn. ok,so i jerked the head off the 2.5 and found....... .......no ring gruve,perfect crosshatch pattern on the cylender walls.....WOW thats GREAT i thought,but i was sure it was to good to be true,so i pulled the oil pan,and.....there was...no endply,the bearings were all tight,and the engine is tight to turn with the head off,not to tight but it feels like a new engine kina tight.............so i am real happy and think i mite just run it...instead of the honda rod's,cam,and all that good stuff....now i am just planing a header a puter upgrade and some throttle body upgrades. ok,progress has been at an all time low,work has realy picked up this week and less it rains mite not slow down for a while...but i did get my last coat of paint on the car and will hopefully get the clear on tomaro night....i think it looks realy good,the pictures dont do it justice,and i only have $80 in the paint so i caint complain...i am trying to decide on a radiator setup,i am gunna run a 4.3L v-6 chevy ratiator with the 2.5 cuz i think it'll help keep temps down...i have almost made my mind up that i wanna run a spoiler/win type setup and was wondering if anyone has a pic of a car that has the radiator below the rear glass that does not obstruct the rearward veiw ? WOW that purple one is bad A$$ i just dont know how that would look on a baja....thanx 1fasthoe az's looks real clean and all but im worryd about rocks and other debre hitting the radiator.....and az,does it kool well in that position ? I'm very very jealous Its hard enough to find a doner around these parts and if you do, lets just say $200 is a down payment.